Elvis, my incredibly annoying but also really cute office mate. He’s a sparrow-sized species of parrot called the “green-rump parrotlet.” He talks (like a tiny robot) and whistles and does all kinds of other normal parrot things, but he also really likes to tunnel, pull pins out of pincushions (he has his own, now), and push stuff around with his head until it falls off the table. Here he is shredding some fabric scraps I gave him to keep him away from my prototypes. It didn’t work for very long. As much as he gets in my way when I’m trying to get work done, he also keeps my spirits up by being someone I can interact with on days when I don’t make it out of the house much. Are green-rumped parrotlets available in Australia? Can these be imported from the USA to Australia? 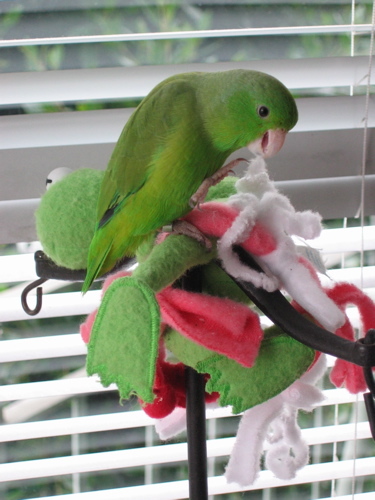 I’m not sure, but if anyone would know, it would be the good folks over at the International Parrotlet Society. Good luck!